The Weather Channel app for Android has been updated with a new and important feature as we go into winter and what is typically the cold & flu season here in the US. The app has a new Health Module that provides you details about the pollen, breathing comfort and flu conditions in your area. It’s a great addition, especially for those who suffer from allergies or have breathing difficulties under certain weather conditions. The update is version 5.10.0 for those keeping score at home and is available now in the Google Play Store. 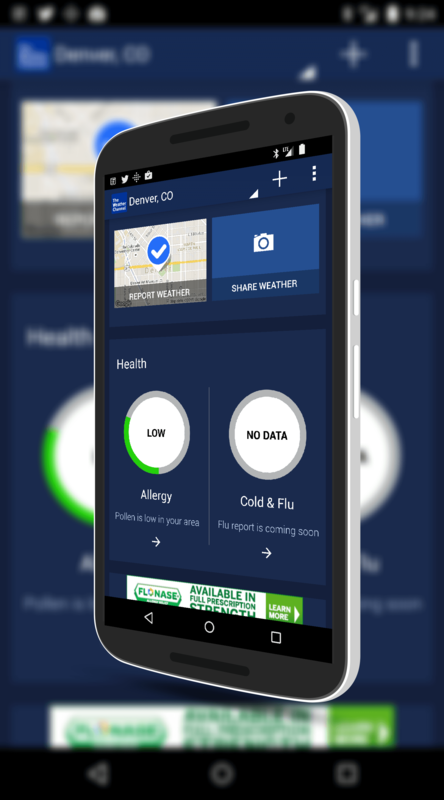 The new Health Module is accessed by swiping down towards the bottom of the main page of the Weather Channel app. It is where the old Pollen Meter was located and replaces that feature. Now you will see two dials, one for Allergy and one for Cold & Flu. If you tap on the Allergy meter it will give you pollen information just like the old Pollen Meter did but adds the ability to see breathing comfort on the day based pollen and climate conditions in your area. You can also see the mold level in your area and how you can control mold levels indoors through your thermostat settings based on the climate conditions. It’s a wealth of information at your fingertips and for those who struggle with allergies or breathing challenges like COPD, could prove to be a great guide on if you should stay indoors on a particular day. The Cold & Flu meter will function in a similar manner, giving you details about flu outbreaks in your area. As these reports are not being published yet, the meter now simply reads “no data” but will activate once reports are published. There are a couple of other updates into the build of the Weather Channel app including better support for those who participate in the mPoints program (points earned by performing certain activities in the app) as well as improved battery performance in the app.